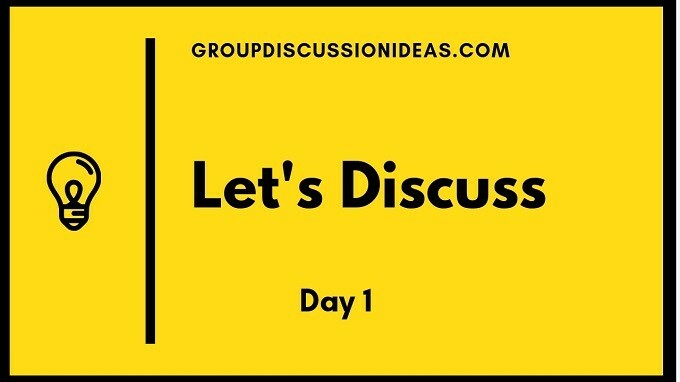 Today we are starting a new program called ‘let’s discuss’. In this program we’ll give you a topic on every Tuesday. Go to the embedded youtube video and present your thoughts on the topic in the comment section of the video by 10AM next day. We’ll read each and every comment and we’ll heart the top 10 comments. These 10 comments will be selected on the basis of how well they articulated their thoughts. And the top most comment will be pinned. Youth play a very important role in politics. Youth are need of our country. They are very energetic they gives vary innovative ideas to improve our economy. In government colleges, now a days election are held which takes very important decision for the students. They have better understanding..what they do or not. Now a days youth are well educated and take a good decision according to the situation. According to me youths are the future of nation. Youth can build the nation. We know in history most of the freedom fighters were youth , Khudiram Basu was hanged for our country’s independence. Binoy , Nadal , Dinesh , Master da Surya Sen they had struggled a lot for our country ‘s independence.They didn’t think of their personal but their aim was to save our country from British ruler. But nowadays politics is getting very dirty I e most of the bright student they don’t want to join politics. We see those are drop out , don’t want to study , involved in bad things they do the politics, they want to hand in glove with the powerful person to get the shelter. They want to take the advantage I e they involve in politics.But youths are want to work for our country for good purpose it is good purpose. 1. They are the innovators which can bring social transformation in society with their new ideas, spirits and energy. 2. In this era of digital technology, youth can proactively reach to the masses , if they participate in politics and directly improved the system of governance. 3. The new energy, young population actively eradicate sins in the society by providing logical explanation to the same. 4. They can act as a bridging gap among the generations especially elder one and younger ones. Thus synchronising the vast sections and utilise them in a positive directions. 5. In today era, most of the youth are highly professionals, which can be beneficial for solving long issues of the nation. which would be win win situation for all. But for this to reap the benefits, the government should provide them adequate platform to proactive participate in politics. YOUTH PARLIAMENT organised by Ministry of parliamentary affairs is one such initiative to understanding the functioning, importance of debates for the functioning of vibrant democracy. More such platforms should be provided by government. 1. They might get attracted towards corruption which could be headache for economy. 2. They might get manipulated by politicians for their own interest ignoring the hidden motive for whch youth enter into politics. 3. Lack of opportunities available for them might be the main hinderance for entering in the politics. 4. Some anti national elements might use them for their own propaganda. Thus, youth must be fully conscious of the nitty gritty while entering into politics. They should make role models of our forefathers who channelise the positive vibes for the development of nations. After all they are the jewels of the nation, the future of the nation lies on their shoulders.